"Church Age" redirects here. For the Mr. Del album, see Church Age (album). Dispensationalism is a religious interpretive system and metanarrative for the Bible. It considers Biblical history as divided by God into dispensations, defined periods or ages to which God has allotted distinctive administrative principles. According to dispensationalist theology, each age of God's plan is thus administered in a certain way, and humanity is held responsible as a steward during that time. Dispensationalists' presuppositions start with the harmony of history as focusing on the glory of God and put God at its center - as opposed to a central focus on humanity and their need for salvation. A dispensational perspective can be seen in the writings of Jewish sects dating from around the time Christianity arose, for example in the Dead Sea Scrolls Community Rule (1QS). Early Christian fundamentalists embraced the system as a defense of the Bible against religious liberalism and modernism, and dispensationalism became the majority position within Christian fundamentalism. God reveals himself and his truth to humanity in a new way. Humanity is held responsible to conform to that revelation. Humanity rebels and fails the test. God judges humanity and introduces a new period of probation under a new administration. Innocence – Adam under probation prior to the Fall. Ends with expulsion from the Garden of Eden. Some refer to this period as the Adamic period or the dispensation of the Adamic covenant or Adamic law. Conscience – From the Fall to the Great Flood. Ends with the worldwide deluge. Human Government – After the Great Flood, humanity responsible to enact the death penalty. Ends with the dispersion at the Tower of Babel. Some use the term Noahide law in reference to this period of dispensation. Promise – From Abraham to Moses. Ends with the refusal to enter Canaan and the 40 years of unbelief in the wilderness. Some use the terms Abrahamic law or Abrahamic covenant in reference to this period of dispensation. Law – From Moses to the crucifixion of Jesus Christ. Ends with the scattering of Israel in AD70. Some use the term Mosaic law in reference to this period of dispensation. Grace – From the cross to the rapture of the church. The rapture is followed by the wrath of God comprising the Great Tribulation. Some use the term Age of Grace or the Church Age for this dispensation. Millennial Kingdom – A 1000 year reign of Christ on earth centered in Jerusalem. Ends with God's judgment on the final rebellion. Numerous purposes for this cycle of administrations have been suggested. God is seen to be testing humanity under varying conditions, while vindicating his ways with humanity in originally granting them free will. The dispensations reveal God's truth in a progressive manner, and are designed to maximize the glory that will accrue to God as he brings history to a climax with a Kingdom administered by Christ, thus vindicating his original plan of administering rule on earth through "human" means. The goal of the dispensations is summarized by Paul the Apostle in Ephesians 1:9-10, "He made known to us the mystery of His will, according to His kind intention which He purposed in Him with a view to an administration suitable to the fullness of the times, that is, the summing up of all things in Christ, things in the heavens and things on the earth" (NASB). One important underlying theological concept for dispensationalism is progressive revelation. Some non-dispensationalists start with progressive revelation in the New Testament and refer this revelation back into the Old Testament, whereas dispensationalists begin with progressive revelation in the Old Testament and read forward in a historical sense. Therefore, there is an emphasis on a gradually developed unity as seen in the entirety of Scripture. Biblical covenants are associated with the dispensations. When these Biblical covenants are compared and contrasted, the result is a historical ordering of different dispensations. Dispensationalism emphasizes the original recipients to whom the different Biblical covenant promises were written. This has resulted in certain fundamental dispensational beliefs, such as a distinction between Israel and the Church. Another important theological concept is an emphasis on the historical-grammatical (or literal) method of biblical interpretation. For example, Israel is said to have literally experienced the curses mentioned by the Old Testament, and dispensationalists believe that the Jews will one day literally receive the blessings mentioned by the Old Testament. Neither the historical-grammatical method nor the concept of progressive revelation is exclusive to dispensationalists. However, a dispensational distinctive is created when the historical-grammatical method is coupled with an emphasis on progressive revelation, along with the historical development of the covenants in Scripture. Dispensationalists profess a definite distinction between Israel and the Church. For dispensationalists, Israel is an ethnic nation consisting of Hebrews (Israelites), beginning with Abraham and continuing in existence to the present. The Church, on the other hand, consists of all saved individuals in this present dispensation—i.e., from the "birth of the Church" in Acts until the time of the Rapture. According to progressive dispensationalism in contrast to the older forms, the distinction between Israel and the Church is not mutually exclusive, as there is a recognized overlap between the two. :295 The overlap consists of Jewish Christians such as Peter and Paul, who were ethnically Jewish and also had faith in Jesus. Dispensationalists believe that Israel as a nation will embrace Jesus as their messiah toward the end of the Great Tribulation, right before the Second Coming. Classical dispensationalists refer to the present-day Church as a "parenthesis" or temporary interlude in the progress of Israel's prophesied history. Progressive dispensationalism "softens" the Church/Israel distinction by seeing some Old Testament promises as expanded by the New Testament to include the Church. However, progressives never view this expansion as replacing promises to its original audience, Israel. Classic dispensationalism began with John Nelson Darby. Darby was succeeded by C. I. Scofield, Harry A. Ironside, Lewis Sperry Chafer, William R. Newell, and Miles J. Stanford, each of whom identified Pentecost (Acts 2) with the start of the Church as distinct from Israel; this may be referred to as the "Acts 2" position. Though Scofield and Ironside were dispensationalists, they would not be regarded as Pauline dispensationalists. Chafer, Newell, and, especially, Stanford - though all Acts 2 dispensationalists - were distinctly Pauline (theologically). Other Acts 2 Pauline dispensationalists include R. B. Shiflet, Roy A. Huebner, and Carol Berubee. In contrast, Grace Movement Dispensationalists believe that the church started later in Acts and emphasize the beginning of the church with the ministry of Paul. Advocates of this "mid-Acts" position identify the start of the church variously from with the salvation of Saul in Acts 9 to the Holy Spirit's commissioning of Paul in Acts 13. The "Acts 28" position posits the beginning of the church in Acts chapter 28 where the Apostle Paul quotes Isaiah 6:9-10 concerning the blindness of Israel, announcing that the salvation of God is sent to the Gentile world (Acts 28:28). 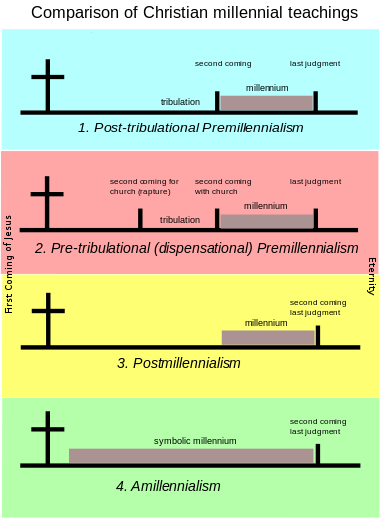 Dispensationalists are premillennialists who affirm a future, literal 1,000-year reign of Jesus Christ which merges with and continues on to the eternal state in the "new heavens and the new earth", and they claim that the millennial kingdom will be theocratic in nature and not mainly soteriological, as it is considered by George Eldon Ladd and others with a non-dispensational form of premillennialism. Dispensationalism is known for its opinions respecting the nation of Israel during this millennial kingdom reign, in which Israel as a nation plays a major role and regains a king, a land, and an everlasting kingdom. The vast majority of dispensationalists profess the pretribulation rapture, with small minorities professing to either a mid-tribulation or post-tribulation rapture. Timeline of the history of Dispensationalism, showing the development of various streams of thought. The concept of the arranging of divisions of Biblical history dates back to Irenaeus during the second century. Other Christian writers since then have offered their own arrangements of history, such as Augustine of Hippo and Joachim of Fiore (1135–1202). :116 Many Protestant and Calvinist writers also developed theological schemes and divisions of history, in particular after the Westminster Confession of Faith noted "various dispensations". Other concepts also predated dispensationalism as a system, such as premillennialism and the rapture. Dispensationalism developed as a system from the teachings of John Nelson Darby (1800–82) who strongly influenced the Plymouth Brethren of the 1830s in Ireland and England. The original concept came when Darby considered the implications of Isaiah 32 for Israel. He saw that prophecy required a future fulfillment and realization of Israel's kingdom. The New Testament church was seen as a separate program not related to that kingdom. Thus arose a prophetic earthly kingdom program for Israel and a separate "Mystery" heavenly program for the church. In order to not conflate the two programs, the prophetic program had to be put on hold to allow for the church to come into existence. Then it is necessary for the church to be raptured away before prophecy can resume its earthly program for Israel. Some critics have claimed that there was no Christian teaching of a rapture before Darby began preaching about it in the 1830s, but recent research has discovered many sources in the preceding 250 years showing a development of the concept. In Darby's conception of dispensations, the Mosaic dispensation continues as a divine administration over earth up until the return of Christ. The church being a heavenly designated assembly does not have its own dispensation as per Scofield. Darby conceives of dispensations relating exclusively to the divine government of the earth and thus the church is not associated with any dispensations. Darby traveled extensively to continental Europe, New Zealand, Canada, and the United States in an attempt to make converts to the Brethren philosophy. While his Brethren ecclesiology failed to catch on in America, his eschatological doctrine became widely popular in the United States, especially among Baptists and Old School Presbyterians. :293 American dispensationalism crossed over many denominational boundaries. On the other hand, Darby most likely thought of and then developed the idea of pre-tribulationism in the process of shifting to futurism. Paul Wilkinson notes that "Darby found an exegetical basis in Scripture for his doctrine of a pretribulation Rapture. As a careful student of the Bible, Darby had no need to appeal to an oracle for his doctrines. The unfounded and scurrilous accusations of MacPherson and his sympathizers contravene the whole ethos of John Nelson Darby, a man of integrity to whom the Word of God was paramount." John Nelson Darby is considered by some to be the father of dispensationalism,:10, 293 which was adopted, modified, and made popular in the United States by the Scofield Reference Bible. Charles Henry Mackintosh (1820–96) popularized Darby more than any other Brethren author. Dispensationalism was introduced to North America by James Inglis (1813–72) through the monthly magazine Waymarks in the Wilderness, published intermittently between 1854 and 1872. During 1866, Inglis organized the Believers' Meeting for Bible Study, which introduced dispensationalist ideas to a small but influential circle of American evangelicals. They were disturbed by the inroads of religious liberalism and saw premillennialism as an answer. Dispensationalism was introduced as a premillennial position, and it largely took over the fundamentalist movement, over a period of several decades. The American church denominations rejected Darby's ecclesiology but accepted his eschatology. Many of these churches were Presbyterian and Baptist, and they retained Darby's Calvinistic soteriology. After Inglis' death, James H. Brookes (1830–98), the pastor of Walnut Street Presbyterian Church in St. Louis, organized the Niagara Bible Conference (1876–97) to continue the dissemination of dispensationalist ideas. Dispensationalism was boosted after Dwight L. Moody (1837–1899) learned of dispensational theology from an unidentified member of the Brethren during 1872. Moody worked with Brookes and other dispensationalists and encouraged the spread of dispensationalism. The efforts of C.I. Scofield and his associates introduced dispensationalism to a wider audience in America by his Scofield Reference Bible. The publication of the Scofield Reference Bible during 1909 by the Oxford University Press for the first time displayed overtly dispensationalist notes on the pages of the Biblical text. The Scofield Bible became a popular Bible used by independent Evangelicals in the United States. Evangelist and Bible teacher Lewis Sperry Chafer (1871–1952) was influenced by Scofield; he founded the Dallas Theological Seminary during 1924, which has become the main institution of dispensationalism in America. The Baptist Bible Seminary in Clarks Summit, Pennsylvania became another dispensational school. Grace School of Theology opened in Houston, TX in 2003 as a dispensational school. Founded by graduates of Dallas Theological Seminary, it holds "that the Bible must be interpreted as language is normally used, recognizing the importance of dispensational distinctions." Other prominent dispensationalists include Reuben Archer Torrey (1856–1928), James M. Gray (1851–1925), William J. Erdman (1833–1923), A. C. Dixon (1854–1925), A. J. Gordon (1836–95), and William Eugene Blackstone, author of the book Jesus is Coming (endorsed by Torrey and Erdman). These men were active evangelists who promoted a host of Bible conferences and other missionary and evangelistic efforts. They also gave the dispensationalist philosophy institutional permanence by assuming leadership of new independent Bible institutes, such as the Moody Bible Institute during 1886, the Bible Institute of Los Angeles (now Biola University) during 1908, and Philadelphia College of Bible (now Cairn University, formerly Philadelphia Biblical University) during 1913. The network of related institutes that soon developed became the nucleus for the spread of American dispensationalism. Dispensationalism has become very popular with American evangelicalism, especially among nondenominational Bible churches, Baptists, Pentecostal, and Charismatic groups. Conversely, Protestant denominations that embrace covenant theology as a whole tend to reject dispensationalism. For example, the General Assembly of the Presbyterian Church (U.S.) (which subsequently merged with the United Presbyterian Church in the U.S.A. (PCUSA) in which Dispensationalism existed) termed it "evil and subversive" and regarded it as a heresy. The Churches of Christ underwent division during the 1930s as Robert Henry Boll (who taught a variant of the dispensational philosophy) and Foy E. Wallace (representing the amillennial opinion) disputed severely over eschatology. Dispensationalism rejects the notion of supersessionism, still considers the Jewish people as God's chosen people, and some see the modern State of Israel as resulting in the Israel who will receive the fulfillment of all God's Old Testament promises. John Nelson Darby taught, and most subsequent dispensationalists have maintained, that God considers the Jews as his earthly chosen people, even as they remain in rejection of Jesus Christ, and God continues to maintain an earthly destiny in the future millennial Kingdom when the Lord Jesus Christ returns to earth and establishes it in fulfillment of prophecy in the prophetic scheme. Dispensationalists teach that a remnant within the nation of Israel will be born again, called of God, and by grace brought to realize that they crucified their Messiah. Dispensationalism is unique in teaching that the Church stands in a dispensation that occurs as a parenthesis in the prophetic Kingdom program, a dispensational "mystery" or "grace" period, meaning that it was not directly revealed in prophecy in the Old Testament, and that this "age of grace" will end with the rapture of the church allowing the prophetic clock for Israel to start up again. Then the Jewish remnant becomes manifest through the Great Tribulation as a result of recognizing Jesus as their promised Messiah during the trials that come upon them in this Tribulation which serves to purify the nation. Darby's teachings envision Judaism as continuing to enjoy God's protection literally to the end of time, and teach that God has a separate earthly and prophetic Kingdom "program," to use J. Dwight Pentecost's term, for Israel and another heavenly (destined) Mystery program for the Church. Dispensationalists teach that God has eternal covenants with Israel which cannot be violated and must be honored and fulfilled. Dispensationalists affirm the necessity for Jews to receive Jesus as Messiah, while also stressing that God has not forsaken those who are physically descended from Abraham through Isaac. They claim that God made unconditional covenants with Israel as a people and nation in the Abrahamic, Palestinian, Davidic, and New Covenant. Christian dispensationalists sometimes endorse what some critics have pejoratively termed Judeophilia, ranging from endorsement of the state of Israel to observing traditional Jewish holidays and practicing traditionally Jewish religious rituals. (See also Christian Zionism, Jewish Christians, Judaizers, Hebrew Roots, and Messianic Judaism). Dispensationalists typically endorse the modern state of Israel, consider its existence as a political entity as God revealing his will for the Last Days, and reject anti-Semitism. Dispensationalists tend to have special interest in the Jews because the dispensationalist hermeneutic honors Biblical passages that list Jews as among God's chosen people. Some Messianic Jews, however, reject dispensationalism in favor of related but distinct hermeneutics called Olive Tree Theology. The name refers to the passages of Romans 11:17–18: "If some of the branches were broken off, and you, a wild olive, were grafted in among them and have become equal sharers in the rich root of the olive tree, then don't boast as if you were better than the branches!" Political commentator Kevin Phillips claimed in American Theocracy (2006) that dispensationalist and other fundamentalist Christians, together with the oil lobby, provided political assistance for the invasion of Iraq during 2003. Dispensationalist themes form the basis of the popular Left Behind series of books. ^ Mike Stallard. "Progressive Dispensationalism" (PDF). Archived from the original (PDF) on 2011-07-19. Ladd starts the eschatological kingdom in the Gospels. Progressives start the kingdom with the ascension of Christ. The most significant difference, however, is that Ladd treats the Church as a kind of "New Israel" in his commentary on Revelation. Progressive dispensationalism in no way advocates that the Church replaces Israel as in Ladd and in a more developed way in Covenant Theology (including brands of covenant premillennialism). ^ Ryrie, Charles Caldwell (1965). Dispensationalism Today. Chicago: Moody Press. p. 137. ^ Ironside, Harry A. "Not Wrath, but Rapture". Archived from the original on 2016-02-03. The prophetic clock stopped at Calvary; it will not start again until ‘the fulness of the Gentiles be come in’. ^ a b c Blaising, Craig A.; Bock, Darrell L (1993). Progressive Dispensationalism. Wheaton, IL: BridgePoint. ISBN 1-56476-138-X. ^ The Apostle Paul was a Roman citizen, but he was of the tribe of Benjamin by birth and also a Jewish nationalist (Rom 9:1-3). ^ Harry A. Ironside. "The Great Parenthesis". It is the author's fervent conviction that the failure to understand what is revealed in Scripture concerning the Great Parenthesis between Messiah's rejection, with the consequent setting aside of Israel nationally, and the regathering of God's earthly people and recognition by the Lord in the last days, is the fundamental cause for many conflicting and unscriptural prophetic teachings. Once this parenthetical period is understood and the present work of God during this age is apprehended, the whole prophetic program unfolds with amazing clearness. ^ Mike Stallard. "Progressive Dispensationalism" (PDF). Archived from the original (PDF) on 2011-07-19. some OT promises can be expanded by the NT. However, this expansion is never viewed as replacing or undoing the implications of that OT promise to its original audience, Israel. For example, the Church's participation in the New Covenant taught in the NT can add the Church to the list of recipients of the New Covenant promises made in the OT. However, such participation does not rule out the future fulfillment of the OT New Covenant promises to Israel at the beginning of the Millennium. Thus, the promise can have a coinciding or overlapping fulfillment through NT expansions of the promise. ^ Charles Caldwell Ryrie (1995), Dispensationalism, (p.53) ...the Scofield Reference Bible... is Watts's [dispensational] outline, not Darby's! ^ Harry A. Ironside. "Wrongly Dividing The Word of Truth. Chapter 3: The Transitional Period. Is the Church of The Acts the Body of Christ?". Here we are distinctly informed as to the way in which the Body has been brought into existence, and this is exactly what took place at Pentecost. ^ Robert C. Brock. "The Teachings of Christ". The ministry of Christ did not stop with His ascension in the first chapter of the book of Acts. Christians have failed to realize that when Saul is saved in Acts 9, a NEW ministry of the Lord Jesus Christ is begun by God, and this NEW ministry ushers in this present age of grace. Saul's name is changed to Paul, and he is designated as the Apostle of the Gentiles (Romans 11:13). He is given revelations from the risen Christ, and these are the revelations embracing Christianity. ^ Walvoord, John F (1990). Blessed hope and the tribulation. Contemporary Evangelical. ISBN 978-0-310-34041-6. ^ Covenant Theology emerged from the Reformed tradition, which considers Biblical history through the "covenant of Grace" (not recorded in scripture) as administered variously through the actual recorded covenants in scripture. While many covenant theologians developed dispensational schemes, they were not theological dispensationalists even if Ryrie appeals to them for this one element of dispensationalism. ^ Watson, William (2015). Dispensationalism Before Darby: Seventeenth-Century and Eighteenth-Century English Apocalypticism. Silverton, OR: Lampion Press. ISBN 978-1-942-61403-6. ^ Elwell, Walter A. (1984). Evangelical Dictionary of Theology. Grand Rapids, MI: Baker Book House. ISBN 0-8010-3413-2. ^ "Doctrinal Statement - Grace School of Theology". Grace School of Theology. Retrieved 2018-10-23. ^ "Reflections: dispensationalism". Bible.org. .
^ Prior to World War II, there had been no significant presence of amillennialism in Churches of Christ. See also Augustine of Hippo, the theologian who established amillennialism as the eschatology of the Roman Catholic Church. ^ "Home - Friends of Israel". www.foigm.org. ^ David H. Stern, Messianic Jewish Manifesto, The Complete Jewish Bible, and The Jewish New Testament Commentary. ^ Greene, Richard Allen (2006-07-19). "Evangelical Christians plead for Israel". BBC News. Retrieved 2007-03-20. ^ Kirkpatrick, David (2006-11-14). "For Evangelicals, Supporting Israel Is 'God's Foreign Policy'". New York Times. New York, NY. Retrieved 2018-05-06. ^ "Israel Reconsiders Decision to Cut Ties With Pat Robertson". Haaretz. 2006-01-15. Retrieved 2018-10-09. ^ Waage, John (2017-06-05). "CBN and Israel: A Friendship That's Strong and Steadfast". cbn.com. Christian Broadcasting Network. Retrieved 2018-10-09. ^ Phillips, Kevin (2006-03-21). American Theocracy: The Peril and Politics of Radical Religion, Oil, and Borrowed Money in the 21st Century. Penguin. p. 87. ISBN 9781101218846.